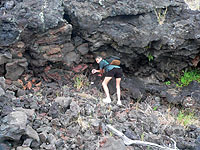 To find The Great crack take Highway 11 from Volcano towards Kona. 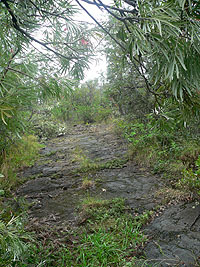 Between the 46 and 47-mile marker, on the mauka (mountain) side of the road is a paved pullout, and on the left side of the road is an overgrown dirt road. Park your vehicle at the pullout. You can make this hike as long as you wish. We went out to the crack and then walked about 1/4 mile along the crack and returned. This took a bit over 3 hours including several exploratory stops and a bite to eat. The hike is fairly simple as you are following a road up till the last quarter mile, at which point you cross a fairly smooth lava flow. Though we did not notice it on the way in, we descended quite a bit and the return trip is just a bit of a huff. All in all this is a pretty easy hike. Since this is in Ka'ū assume a desert condition so bring sunscreen, water, and a hat. Don't fall in the crack. 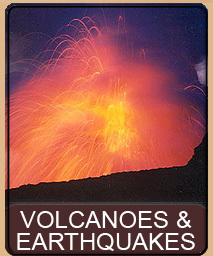 As an active volcanic island, the Big Island of Hawai'i is still under constant formation. While the island slowly drifts with the Pacific plate it drags itself over the deep hotspots that create the various volcanoes and vents. As magma layers shift and change, thousands of earthquakes, from the barely detectable to full-scale, push and pull on the island. As you can well imagine all of this geophysical exercise causes quite a bit of stress on the land. 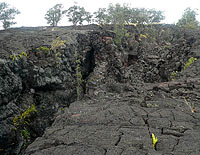 One of the things that form on volcanic islands are rift zones. These are areas where the island is somewhat weaker, and large fissures and rifts have been created. 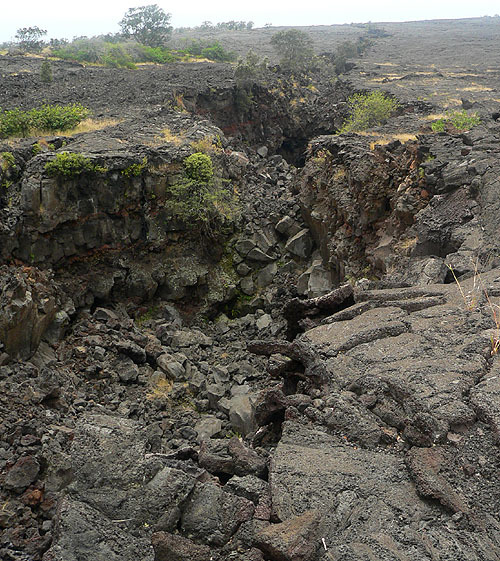 Often these rifts are the sites of volcanic eruptions and occasionally a rift can be so deep and so fractured that it can cause a chunk of the island to fall into the ocean. So what is The Great Crack? 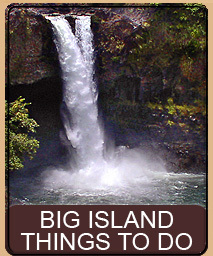 Basically it is an 8 mile long, 60 foot wide and 60 food deep crack in the island, situated in the district of Ka'ū. 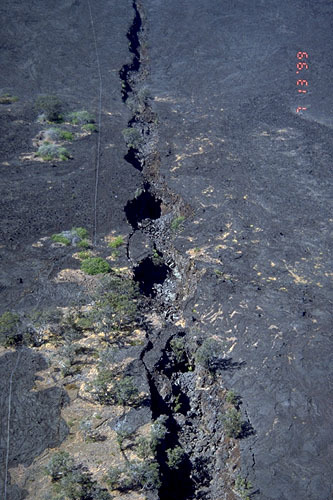 The Great Crack is one of many series of cracks and rifts that was formed by eruptions and, in fact, is an extension of the southwest rift zone. 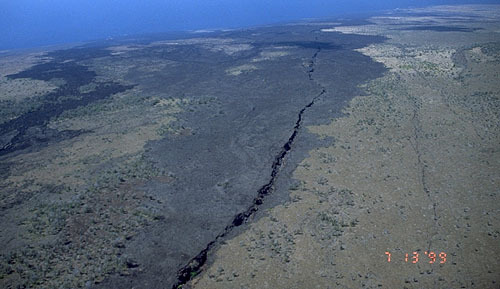 Rumor has it that The Great Crack is a result of the south flank of the Big Island moving away from the rest of the island. Speculation abounds that someday, perhaps soon, a major chunk of the island will break away and fall into the ocean, along with the resulting huge tsunami and earthquakes. This actually does happen every ten thousand years or so, so it is not outside the realm of possibility. Sounds exciting, but this is only a rumor. Indeed, The Great Crack is not a fault that will break the island apart, but instead was created (probably thousands of years ago) as a result of the crust moving apart slightly due to magma forcing itself into the rift zones. The Great Crack has been measured and is tracked and there is no indication that it is enlarging in any way or that the island is shifting near this point. Furthermore, the walls of the crack have been shown to fit together perfectly, thus proving that the crack was a widening of once joined ground. While The Great Crack indeed is long, the 8 mile length does not extend all the way to the ocean but instead stops short of entering the water. 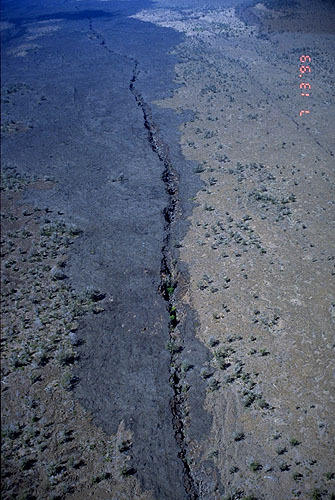 The depth and width of the crack varies along the entire 8 mile length and there is speculation that the crack may not have formed all at once. 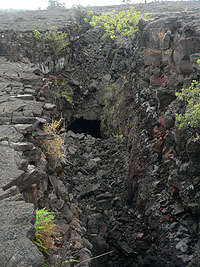 A number of large lava tubes have been found under The Great Crack, some of which still remain uncharted. 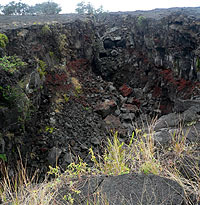 These lava tubes may have also contributed to the formation of The Great Crack. As you can probably imagine, The Great Crack is very hard to photograph and convey some sense of the immense size of this feature. Towards that end we shall first share with you a few larger photos that help illustrate just how magnificent this feature truly is. To give you an overall view of the crack we would have to rent a helicopter and fly really high. 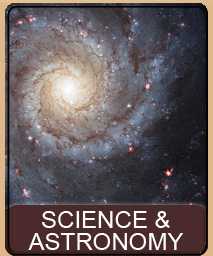 Luckily for us, NASA has already done that. The following three images have been graciously provided to us to use on this site. These images are courtesy of NASA's Virtually Hawai'i Project and show just how truly spectacular The Great Crack is. Truly impressive is it not? We certainly thought so. If you look at the last photo above, to the left of the crack you can see a fairly straight line running along side of the crack. 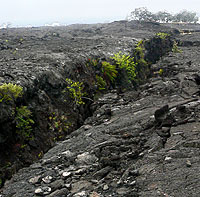 This line is the Hawai'i Volcanoes National Park fence and the crack is just outside the park boundary. While it is possible to access the crack from the park, we are going to take you a much easier and quicker way. When we arrive at the crack we will be near the bottom of the last photo above. 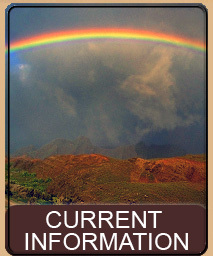 So let's get started on our Hike to The Great Crack in Ka'ū! First, we should say something about this trail. We do not know who owns the land that this trail is on. The land is undeveloped and the trail is gated but there are no "keep out" signs of any type. We understand that this is the trail commonly used to access The Great Crack but be forewarned that portions of this are probably private land. As always, respect the land. 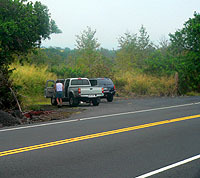 To find the trailhead, take Highway 11 from Volcano into Ka'ū (towards Kona). Between the 46 and 47-mile marker, on the mauka (mountain) side of the road (which will be the right side of the road if you're heading from Volcano) you will see a paved pullout on the right big enough to fit about 4 or 5 cars. Park here. On the makai (ocean, or in this case, left) side of the road you will see a dirt road. Just as a matter of note, when we parked here there was a herd of goats in a nearby pasture, bleating like crazy, and we swear we heard peacocks, which is possible since there are a number of peacocks who have escaped into the wild. So keep on the lookout. On this hike our friends Pam and Wally joined John and myself, so off the four of us go. We cross the highway and go to the dirt road. This is a pretty overgrown area and it is a bit difficult to see the road if you're going fast on the highway. You will note that the road is actually two roads with a gate on the left road and no gate on the road that goes straight. We want to take the left road, the one with the gate. There are two obvious ways to get through the gate. The first is to climb over it, the second is to go through the gap in the fence to the left of it. Each of us did it different but if you go around the gate do be warned to first clear the spiders (shudder). The trail to The Big Crack is basically a rough road the entire way. Rumor has it that the park uses this road to go down and maintain the Hawksbill Turtles at the ocean, and that this road actually crosses The Great Crack at some point. Pam, Wally, and John were wearing sneakers, but I, of course, was in rubber slippahs. They would probably recommend sneakers but I had no problem in the slippahs. So off we go. We picked a day that was very voggy and cloudy, so it was a fairly cool and easy hike. 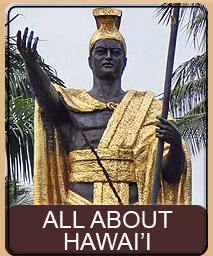 However, normally Ka'ū is a hot place so bring sunscreen and a hat and plenty of water. The road goes in and out of being a good, easy to follow road, to just faint tracks in long grass. You start out with fairly normal trees. 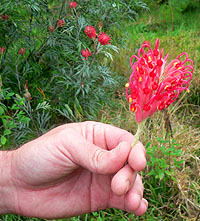 After a short distance you encounter quite a large and impressive stand of Kāhili Flower bushes. 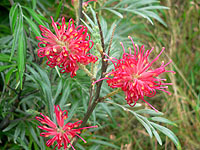 The beautiful flowers on these bushes are very impressive but the bush itself is extremely invasive and the size of the stand of these indeed confirms this fact. We noted quite a number of the bushes had been pushed over. 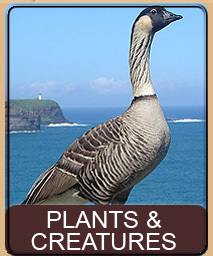 While that is a tactic for killing invasive species we think the wind probably pushed these over. Going up to a smaller bush we noted that the roots were very shallow and it was very easy to push it over. 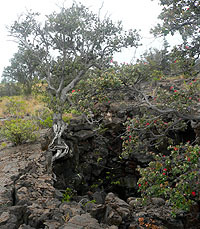 After about a mile the trees thin to a more desert and barren lava landscape. The road takes a number of turns and there are some rather impressive lava hills and cones in the distance. As you round one bend, if you keep watch, there is a painted arrow and the words Old Trail. We will have to save that for another hike. Continue following the road. 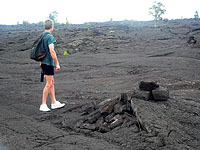 You will begin to see, ahead of you, a huge expanse of very black lava that came from the cones in the distance. 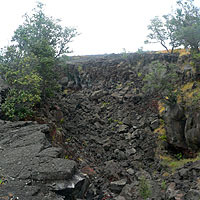 The road starts to parallel this lava. on the right hand side you will now have a large hill with a fairly straight cliff facing you. Between you and the cliff you will see a fissure. We walked to this fissure, first thinking that perhaps this was The Great Crack, and while very nice indeed, it certainly wasn't that great so back to the road we went. The road turned and seemed to take us to the edge of that huge black expanse of lava. Rock cairns marked a vague trail out onto the lava. At this point we are actually going to leave the road. We are unsure where the road is here, and where it goes - but that does not matter. 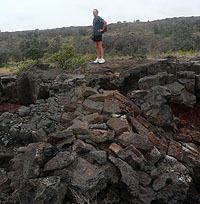 Simply head out across the black lava, going straight across (we ignored the cairns). In just a bit you will pick up the faint line that is the park fence. Keep walking. There is actually a rather large 'Ohi'a Lehua tree that is just a bit to the left of where you entered the lava field and straight across, we went in that direction. As we approached the fence we suddenly came upon The Great Crack. That is pretty impressive. You can barely make out Wally, in the above picture, bent over inspecting something. The crack is immense compared to him - and very hard to photograph. It was also hard to get too close to the edge of this thing. All of us felt vertigo and much of the edge is fractured making the footing seem unstable. Additionally, there are hollow sounds everywhere you walk making us unsure just what we were walking on. In the voggy picture below you can see the crack goes way off into the distance. We are fairly near the start of the crack and at this point it is at least 60 feet across and just as deep. We start to head towards the ocean (makai). The crack varies quite a bit. Some places are narrower and shallower and in a few places the crack is actually filled in and you can cross on a narrow and scary ridge. 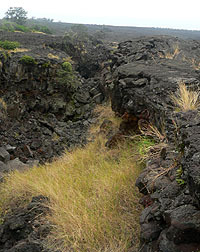 While much of the walls of the crack are rough and jagged, you will see some areas where it appears that smooth flows of lava went over the edges. You may also see on the ground around the crack flattened blobs of lava that appear as if they were thrown from an eruption. Indeed this is true. 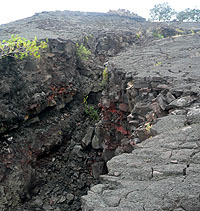 In 1823 a very fluid flow of lava came out of a 6 mile portion of the crack and made its way to the ocean. As we continue down The Great Crack we noted a rather large 'Ohi'a Lehua tree growing at an angle out of the side of the crack. The edge at this point had also fractured and a 5 foot wide chunk of land was poised to fall into the crack. 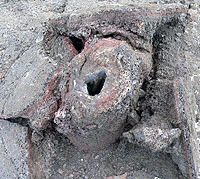 The only thing preventing the collapse of this wall section was the roots of the 'Ohi'a which spanned the small gap and firmly anchored the wall. After walking perhaps a quarter mile down the crack you arrive at a point where there is a drop of perhaps 35 or 40 feet. We stopped at this point for a bite to eat. The view is spectacular because the crack drops below you and you can see it as it heads to the ocean. In the distance we also saw what we thought was a road heading right for, and over the crack. This is probably the extension of the road we started out on. The crack at this point is bridged and you can get across to the other side. The middle is of the ridge is an excellent place for a photo and it is actually possible to scramble down into the crack at this point. John went down and discovered two caches in the walls of the crack containing a flashlight, some cans of tuna fish, candles, rope and a sweatshirt - so someone had obviously been exploring. Since we saw countless lava tubes and caves at the bottom of the crack there is undoubtedly much to see if you are into serious exploring. We turned back at this point and returned the way we came. The day had turned hot and we were unprepared to go further. However, continuing down the crack one can find trails, rock walls, and archaeological sites from as old as the 12th century. Much of these finds are on the park side of the fence. About 1,951 acres of private land beyond the fence was purchased during the Clinton administration specifically to protect the various artifacts in this area as well as to protect the habitat of the turtles. However, near the end of the crack is an area of land between the fence, the crack and the ocean which is not part of the park land and does have many archaeological artifacts on it, but we will save that for another hike. Is The Great Crack truly unique in Hawai'i? 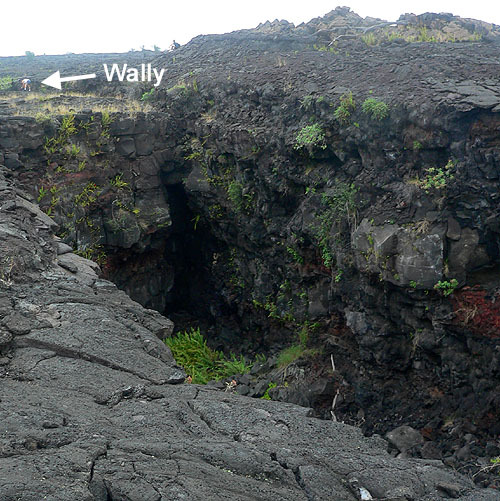 Actually, no, it is one of many cracks throughout the island that normally occur along rift zones. The only thing that makes The Great Crack unique is it is one very long crack! This page is named 'Hikes.crack'. Can't Find It?